(Nanowerk News) Russian researchers together with their French colleagues discovered that a genuine feature of superconductors -- quantum Abrikosov vortices of supercurrent -- can also exist in an ordinary nonsuperconducting metal put into contact with a superconductor. The observation of these vortices provides direct evidence of induced quantum coherence. The pioneering experimental observation was supported by a first-ever numerical model that describes the induced vortices in finer detail. These fundamental results, published in the journal Nature Communications ("Expansion of a superconducting vortex core into a diffusive metal"), enable a better understanding and description of the processes occurring at the interface between superconducting and normal phases, which is important for future quantum technology. Superconductors are materials that conduct electricity with no resistance whatsoever, when cooled below certain temperatures. Discovered one century ago, superconductors are widely used in powerful magnets for MRI scanners, particle accelerators, magnetic levitation trains, advanced electric power transmission lines, and in ultrasensitive detectors. Quantum coherence is the key property of superconductors behind all these applications. That is why its study and understanding is so important. Taking advantage of the macroscopic quantum coherence of superconductors, it is possible to build nanodevices that behave as artificial atoms to be used as qubits, the basic elements of quantum computers. But quantum electronics cannot be developed unless a precise mathematical formalism exists to account for the microscopic processes both in the superconductor itself and in the materials that come in contact with it. Superconductor-normal metal interfaces are omnipresent in superconducting electronic devices, and are actively studied. It is well-known, that when a normal metal and a superconductor come into contact, the electronic properties of both materials are affected in a layer that may extend over several hundred nanometers away from the interface. (One nanometer is one-billionth of a meter, so this layer is relatively thick, for the nanoworld.) The normal metal acquires some superconducting properties. For example, it can support a dissipationless electric current. But can it also accommodate quantum vortices, another genuine property of superconductors? And if so, then how would these vortices behave, and what would affect their characteristics? These are the questions explored in the new paper. Lead author Vasily Stolyarov, deputy head of the Laboratory of Topological Quantum Phenomena in Superconducting Systems at the Moscow Institute of Physics and Technology, comments on the study: "To solve a complex experimental problem, it first needs to be simplified. That is, you look for a simple model system to describe behavior that is more complex. The main result of our research is that we have revealed the precise behavior of an induced vortex of current in the normal metal." "To do this, we found the right way to create the model sample for the experimental study, and did it in a way that facilitated modeling, too," he goes on. 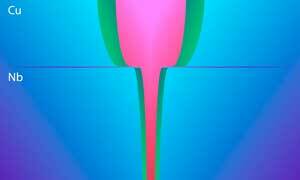 "It turned out, our theoretical model based on Usadel equations could precisely and self-consistently describe the processes at the interface between a superconductor and a normal metal. It accounts for the screening effects of the circulating currents, which means it is fit for practical applications. A further result is that we now understand better what the physical nature of some of the Usadel equation parameters is." 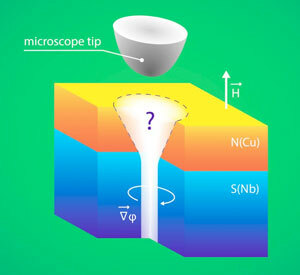 In the experiment illustrated by figure 1, the researchers used a scanning tunneling microscope operating at low temperatures to obtain spectroscopic nano-maps revealing the distribution of "normal" and "superconducting" electrons on the surface of a metal film deposited on a superconductor. These maps demonstrate the existence of induced quantum vortices, which are similar to the Abrikosov vortices in superconductors. "These experiments have been made possible by the advances in scanning tunneling microscopy," explains Stolyarov. "They've enabled us to work at ultralow temperatures and in an ultrahigh vacuum, at 10??? millibars [one-hundred-trillionth of the standard atmospheric pressure at sea level]. These conditions preserve the surface atomically clean for a sufficiently long time, and the temperature is well below that of the superconducting transition of the material. A microscope like the one used in the study is now available in our laboratory at MIPT." The results of the experiment agree with computer simulations, which predict vortex induction in the normal metal right on top of the vortices in the superconductor. To describe the phenomenon in finer detail, the team observed how the vortices behaved at a range of temperatures, in various magnetic fields, and in samples with different metal film thicknesses.